SmartBones have absolutely NO RAWHIDE in them. They are made with wholesome vegetables & REAL chicken. This makes SmartBones highly digestible, and highly palatable. They are also enriched with vitamins & minerals…making them much healthier for dogs than any rawhide chew! SmartBones Have All the Benefits of a Rawhide Chew...WITHOUT the RAWHIDE! NO RAWHIDE SmartBones are made with REAL SWEET POTATOES, CHICKEN and wholesome VEGETABLES for a scrumptious taste dogs can’t resist! Give your pup a chew that helps maintain healthy teeth and gums through the natural action of chewing, while also providing flavor they love. 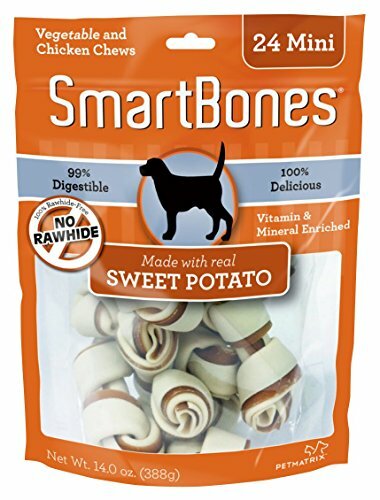 SmartBone Sweet Potato Mini Bones are enriched with vitamins and minerals and perfectly sized for your small dog. They’ll love the vegetable and peanut butter outside and delicious chicken inside; as they chew on a classic knotted bone treat. Mini Bones are 2.5” and great for dogs 5-10 lbs. Each pack contains 24 mini bones. If you have any questions about this product by SmartBones, contact us by completing and submitting the form below. If you are looking for a specif part number, please include it with your message.